This is the way Mr. Frandoni, the Italian chef from the old country used to make it. I knew him in Cincinnati when I was a teenager and he must of been about 75 years old at the time. So I think this is a recipe that is really old. He came to America in 1910. I'm not sure if this receipe came with him from Italy, or if it is something he picked up when he was working as a chef in a restaurant in America. Some people tell me this is the best food they ever ate in their life, and the rest just say it is delicious. Put meat in skillet and chop into smallest pieces possible. After meat has cooked, drain grease in strainer and set aside. In a large separate pan melt the butter and add the olive oil. Chop onions (medium size) and celery and braise in the pan. Chip parsley, garlic, and add them. Add Basil. Braise everything for at least 30 minutes on medium to medium low heat. Transfer this mix into a large pot and add the meat. It is important to let the meat cook with the onion mix for about 15 minutes so that the flavor is transferred to the meat. Then add spinach (drain juice first) and mix: add Philadelphia Cream Cheese and mix: add bread crumbs and mix. Remove from heat and add eggs (yolks and whites) and mix well. Put it back on the heat and add peppers and nutmeg. Cook for about 5 more minutes. 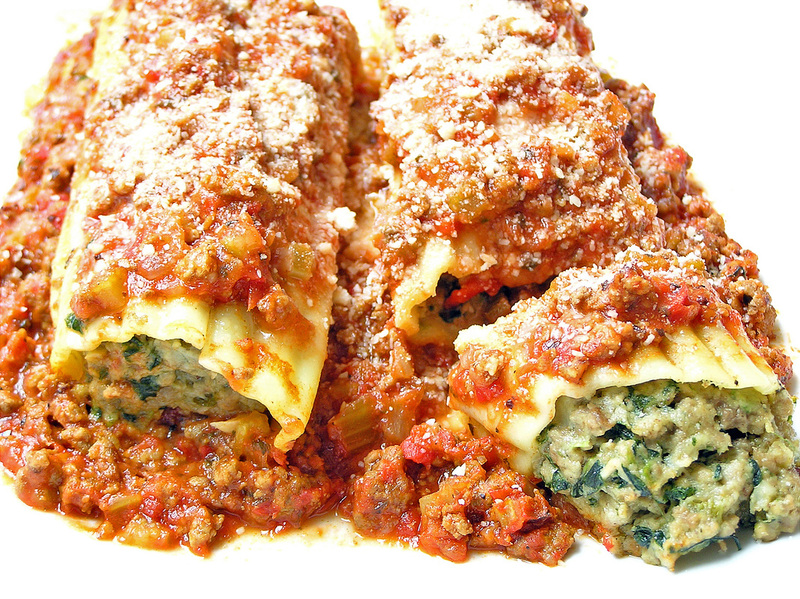 Cook the manicotti shells first in boiling water. Then fill the shells with the filling and place in a 9 X 13 metal pan. Put a layer of spaghetti sauce in the pan first and then add the shells. Top the shells with spaghetti sauce and then sprinkle with the cheese. Place in oven covered at 350 degrees to heat. Takes at least 1 & 1/2 hours and maybe more to heat up. 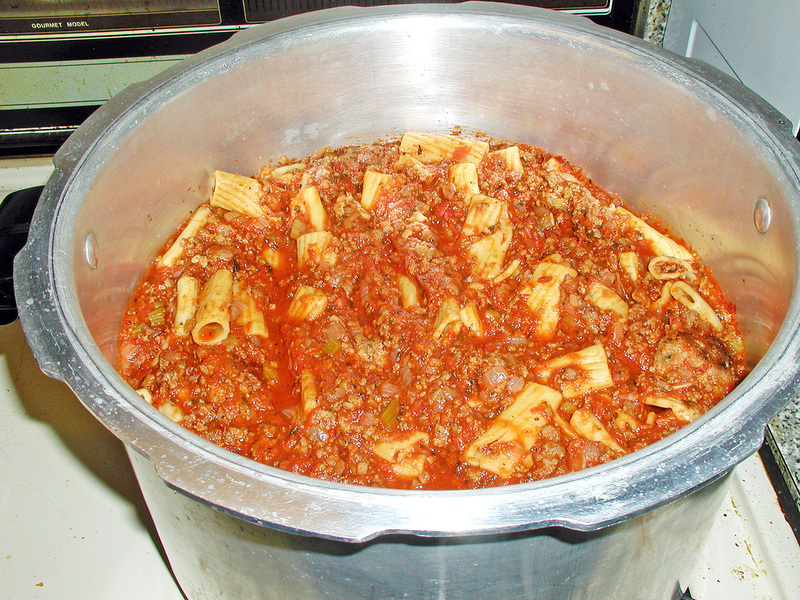 Use any spaghetti sauce you want like Ragu, Prego, or make your own. Note: Don't use Syracuse pork from Tom Thumb. Optional: Just add a pinch of nutmeg. Don’t add any Cayenne pepper—just a little black pepper and salt. Chop onion & celery and sautee in olive oil and butter until soft and somewhat browned. Cook on medium or medium-low heat. Chop garlic and add. Cook meats in separate skillet and break into smallest pieces possible. Drain the grease. Transfer onion mix to large pot (16 qt.) and add the meats. Add tomatoes and tomato juice and wait till simmers. Add pinch of baking soda and stir. This helps take the acid out of the tomatoes. Add spices , salt and pepper to taste. Add sweetener to taste. Add Mostocholli shells to convert to Mostocholli or serve over spaghetti or use with Manicotti recipe. Beat eggs and milk/water. Add rest of ingredients and mix with two tine fork allowing air to flow through (makes tender texture). Do this for 3-5 minutes. Actually I usually just mix it all with my hands. Form into balls and place on cookie sheet and bake 15-20 min at 425. Or can fry in olive oil in a skillet. Add to sauce and let simmer on lo for ½ hour. Gives flavor to meatballs.